"Remember when we used to give them little pilots' wings?" 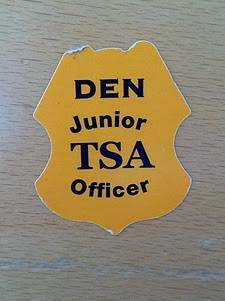 asks author Neal Stephenson, who took this picture of a "Junior TSA Officer" sticker he saw recently, presumably at the Denver airport. He didn't say whether this had been given out by TSA employees, but there are other reports of TSA employees giving similar stickers out to children at airports, and it's hard to see who else would have much interest in doing this kind of thing. I say "employees" because, despite the badges and uniforms, TSA screeners are not "officers"; they have no law enforcement authority except for a relative few who have gone through a separate training program. Screeners cannot make arrests (though they'd sure like to), and have to call in the police to do this. Even air marshals have no law enforcement authority except to stop hijackings. Nor can screeners legally stop you from filming them - which they know you have the right to do - although they do this all the time. They have always had some sort of "badge," but this was changed in 2008 from a patch to a more cop-like metal badge. According to the TSA itself, this change was made "to represent the continuing evolution of the officers' roles and responsibilities," which seems like a concession that the agency deliberately made this change in order to make its fake officers seem more like real ones. (Have these "officers" ever abused this apparent authority? Why, yes, they have.) Handing out "TSA Officer" stickers to kids, even if it's meant well in a particular case, is a facet of this same propaganda. There's a bill currently pending that would roll this back, introduced by Rep. Marsha Blackburn (R-TN) in December. H.R. 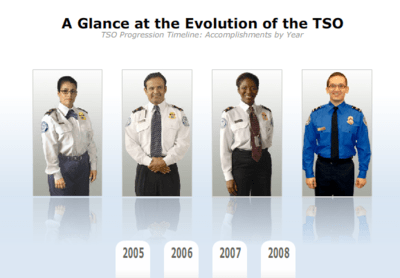 3608, the "Stop TSA's Reach in Policy Act" (yes, the "STRIP Act") would prohibit any TSA employee who has not received the federal law enforcement training from being called an "officer" or wearing a badge or uniform that resembles what a real officer would wear. That is currently sitting in committee, so we'll see what happens. Personally, I'd rather we abolished the whole thing, for many reasons, but getting rid of the fake badges would be a good start.